A competition entry for a parish church for a Lutheran community church on a recently suburbanised site south of Torshaven. The site is accessed along its southern side opposite suburban houses on a gently east facing slope facing down towards the sea. We rejected the competition advice to place parking between the road and the church, preferring to place the parking on the east side so that there was direct access to the church from the road. On the north side of the site is a river and cycle-way and a distant view of more suburban housing, but this area is intended to be protected as a small slice of wild landscape within the recent suburban development. 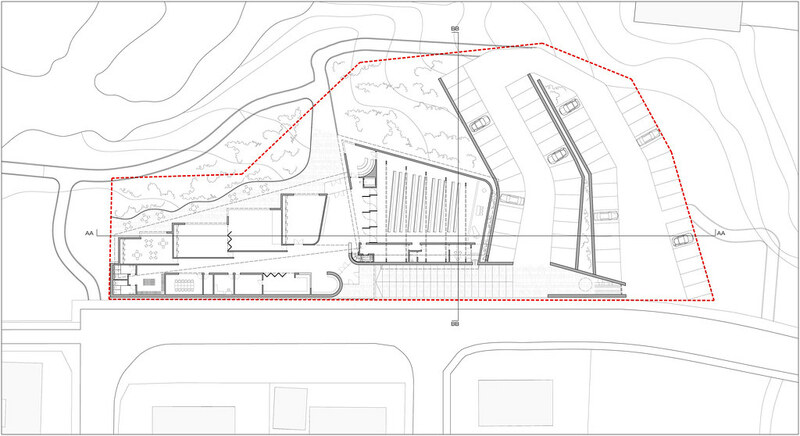 The church design therefore presents two very different elevations to south and north. Two giant mono-pitch roofs cover the church itself to the east and all the parish rooms requested in the brief to the west. In the Faroe's tradition, these are covered in turf; in this way the bulk of the church disappears into the landscape when seen from the cycle way and the river. To the south, the church presents an elevation of dry stone walling and clerestorey glazing with the entrance in the centre. A secondary entrance opposite this on the north elevation connects to the cycle-way. 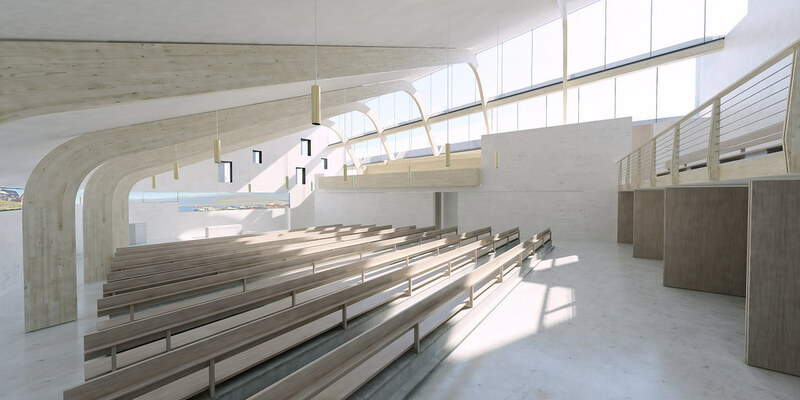 Internally, the church volume itself is made of asymmetrical laminated timber structure. It has a tapering plan giving three tapering clerestorey windows admitting the low winter sun into the space. Behind the altar and above the celebrant there is a panoramic window which avoids the view of cars and housing but frames the sea and an offshore island to the east. The choir and organ are on the gallery on the south side of the church with the sacristy beneath. A rear gallery above the entrance door provides extra seating when required. The parish rooms accommodation is a sequence of rooms lit from north and south facing clerestorey. 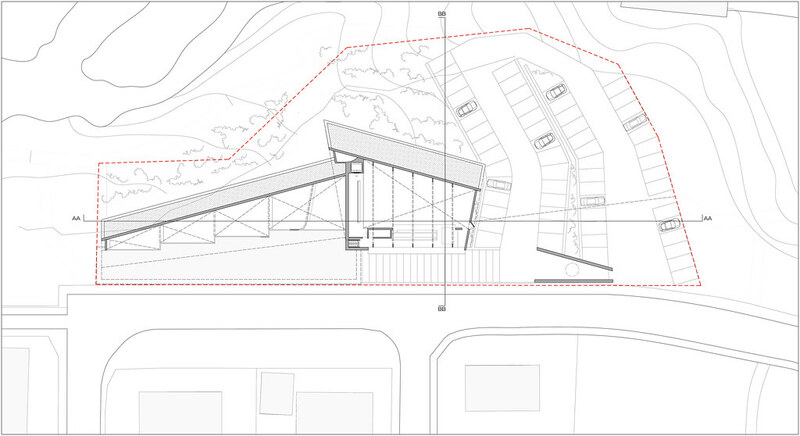 Rooms can be combined and each room gives access to a terrace adjacent to the river. The church itself is set back from the road with a shallow staircase between car park and entrance and this is marked at its lower end with a detached church tower and bells which forms a gateway to the stepped promenade to the main entrance.